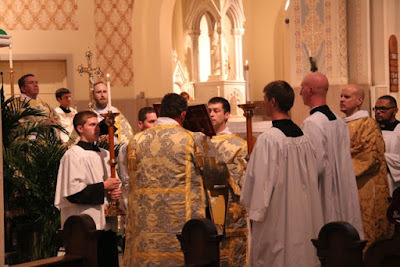 This article and the accompanying pictures were submitted by reader Barbara Wyman a few days ago, but I saved them for today, the eve of the eighth anniversary of the motu proprio Summorum Pontificum. 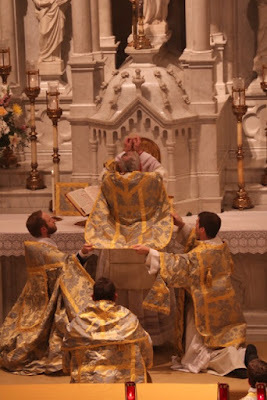 Many years ago, in a place that shall remain nameless, friends and colleagues of mine were involved in organizing a Pontifical Mass, which was preceded by much wringing of hands over whether a full Pontifical Mass was opportune, or whether a Prelatitial Mass (i.e. 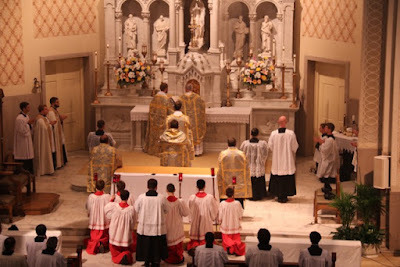 the bishop’s form of Low Mass) would be less “controversial”. Happily, these controversies have (in many places, by no means all) become a thing of the past, and there is no longer any surprise or novelty to hear of an American bishop saying a Pontifical Mass from the throne in his own cathedral - another reason to thank Pope Benedict! 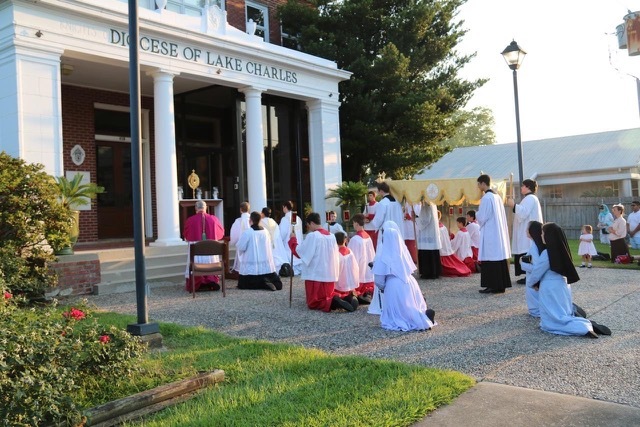 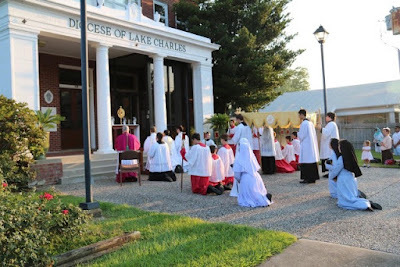 “If you build it, they will come” has once again been proven true, this time in the Diocese of Lake Charles, Louisiana, under the spiritual guidance of His Excellency Bishop Glen John Provost. 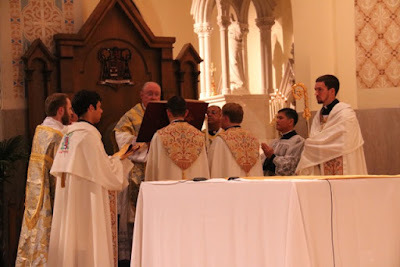 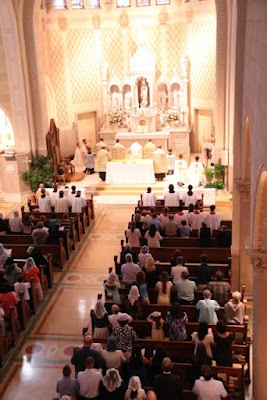 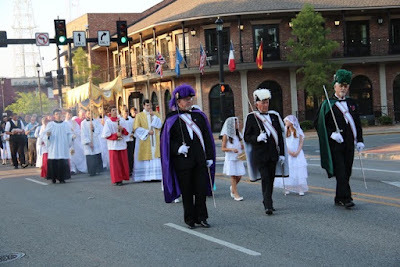 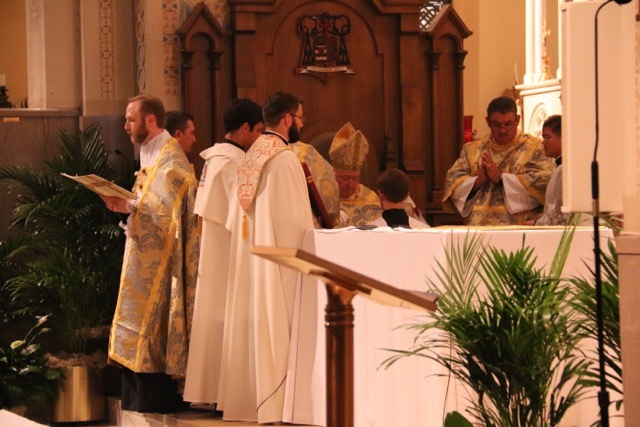 Since his installation as 3rd Bishop of Lake Charles on April 23, 2007, Bishop Provost has celebrated several Pontifical High Masses in the Extraordinary Form throughout the diocese, three at the throne in his own cathedral, the latest being in celebration of the Nativity of St. John the Baptist on June 24th, 2015. 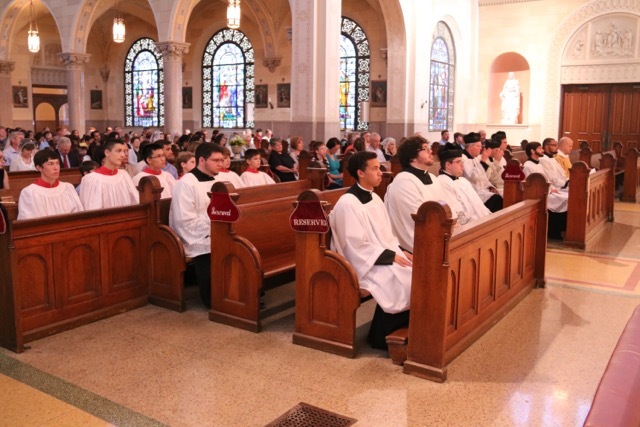 The crowds have been growing with each subsequent Pontifical High Mass, but on this occasion especially a record numbers of diocesan priests, visiting priests, deacons, and seminarians were present, as the following pictures show. 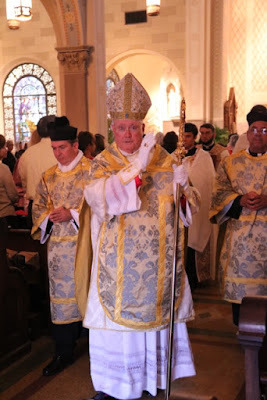 The beautiful vestments worn by the clergy were purchased for the occasion of the 100th Anniversary of the Cathedral of the Immaculate Conception on Aug. 22, 2013, at which time, Archbishop Carlo Maria Viganò, the Apostolic Nuncio to the United States from the Holy See, officiated at the crowning rite of the statue of the Blessed Virgin Mary. 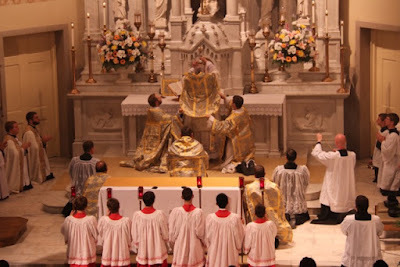 The statue that was crowned, in the name of the Holy Father and by his authority, is located in the niche of the Cathedral’s high altar, and visible in the photos. The crown was custom designed and fashioned by Fratelli Savi, one of the most distinguished workshops in Rome for church items. 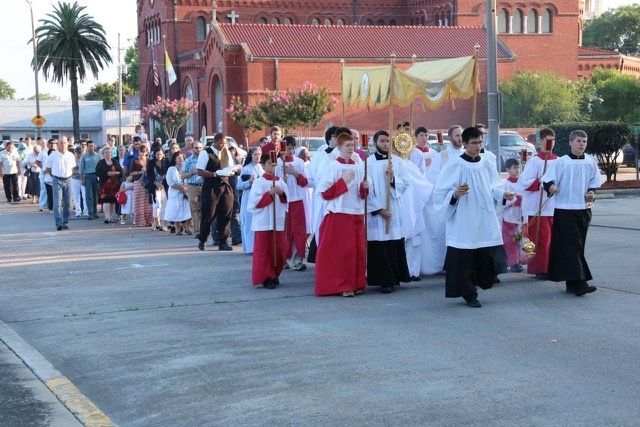 Photos of the recent Corpus Christi Procession mentioned above.